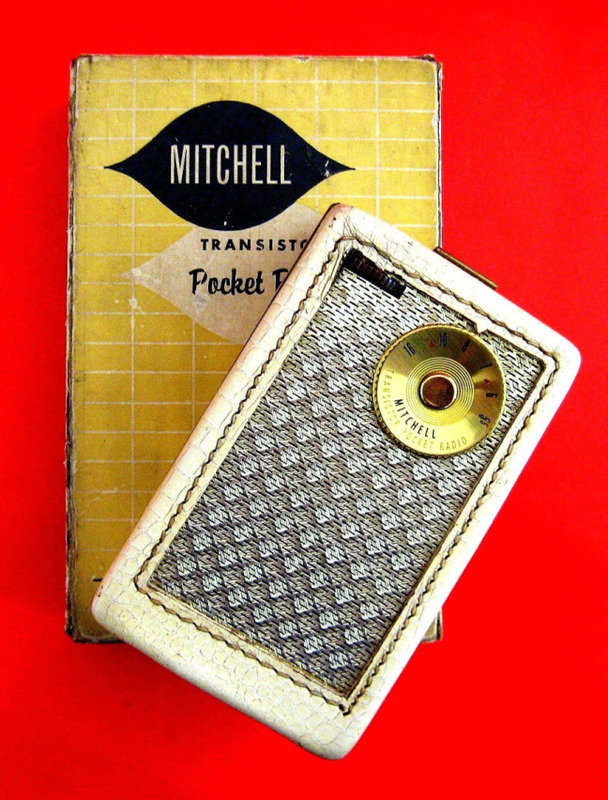 This Mitchell 1103 colored ‘Antique White’ is a variant of the Regency TR-1 – the world’s first transistor radio. 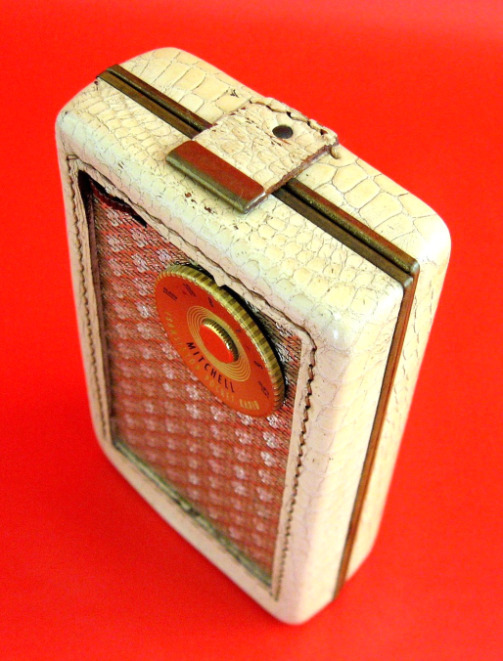 According to an article by Paul R Farmer in the AWA Review Vol 17 there were only about 3000 Mitchell’s manufactured in 1955 and only 500 in the antique white color. There are thought to be only 25 – 50 left in the world today! 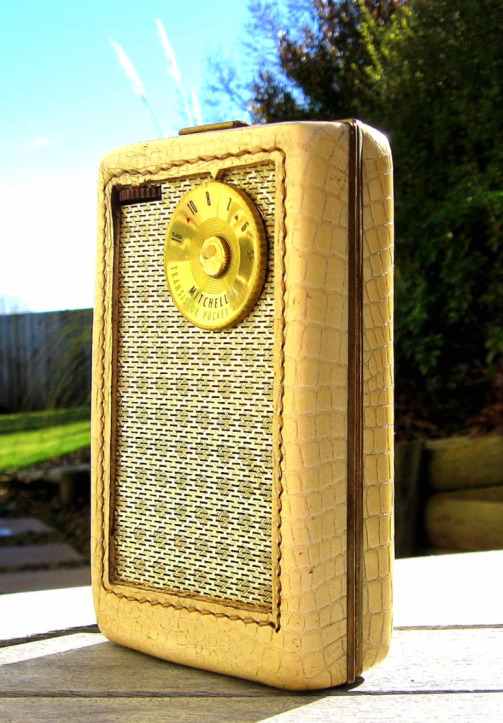 Contrast that with how many Regency TR-1’s were manufactured – just over 100,000 with probably around 10,000 left today and you can appreciate how rare this radio is. IMHO it is the ugly duckling of the Regency TR-1 family. It is kind of primitive looking with its leather clad case. When compared to a Regency TR-1 it looks like a caveman dressed in animal skins standing next to a gentleman dressed in a fine Italian designer suit! Ref: The Regency TR-1: 50 Years On by Paul R Farmer AWA Review Volume 17. 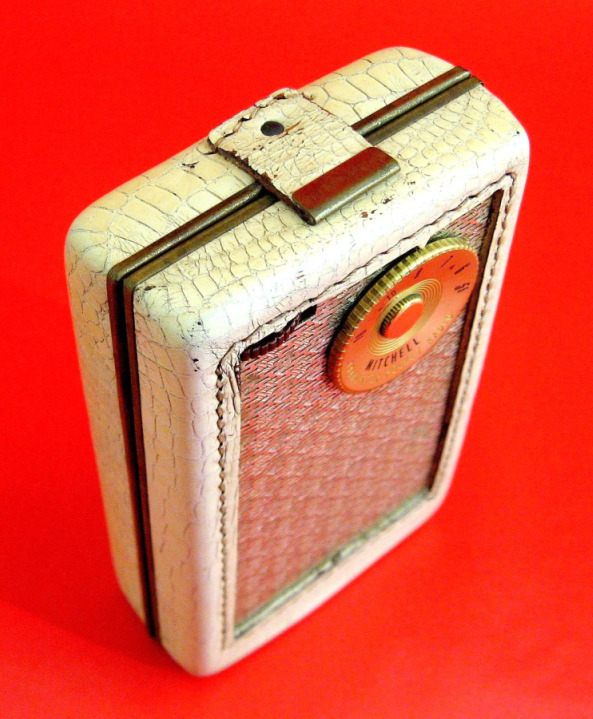 Mitchell’s were produced in three colors; Suntan 1101, Alligator 1102 and this Antique White 1103 example. 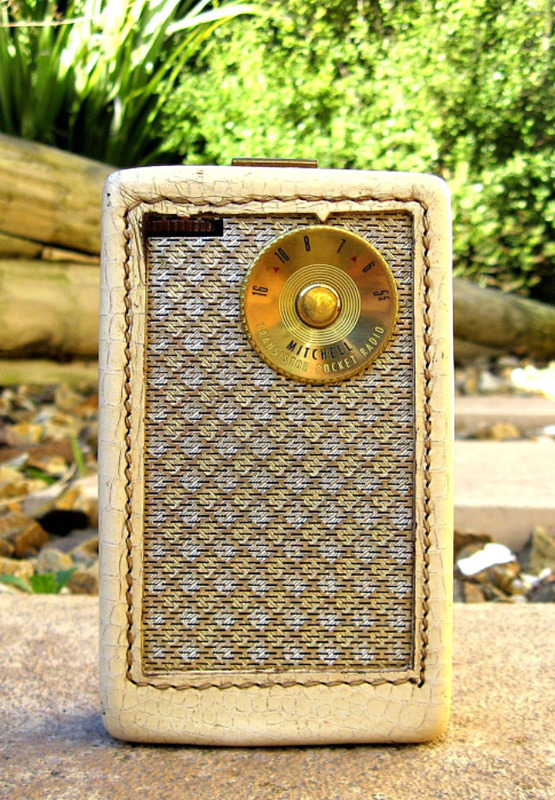 The gold tuning dial has centered concentric rings and ‘Mitchell Transistor Pocket Radio’ written on it. It has nice little CD era marks in red and is smaller than the tuning dial on a Regency TR-1. The leather case is hinged with a dome clip at the top and a small cut out tuning indicator above the gold dial. 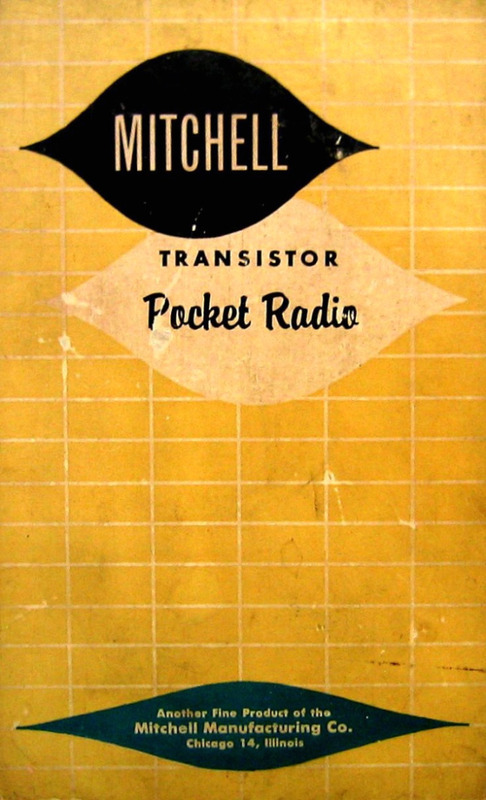 This Mitchell 1103 was one of the earliest transistor radios manufactured, but by whom? On the box it states “Another Fine Product Of The Mitchell Manufacturing Company Chicago Illinois” But this Mitchell is simply a Regency TR-1 encased in a hard leather cabinet and it was almost certainly manufactured at the I.D.E.A. Regency Factory, Indianapolis USA. The designers of the Regency Cabinet, Painter, Teague and Petertil were also based in Chicago along with the Mitchell Company. 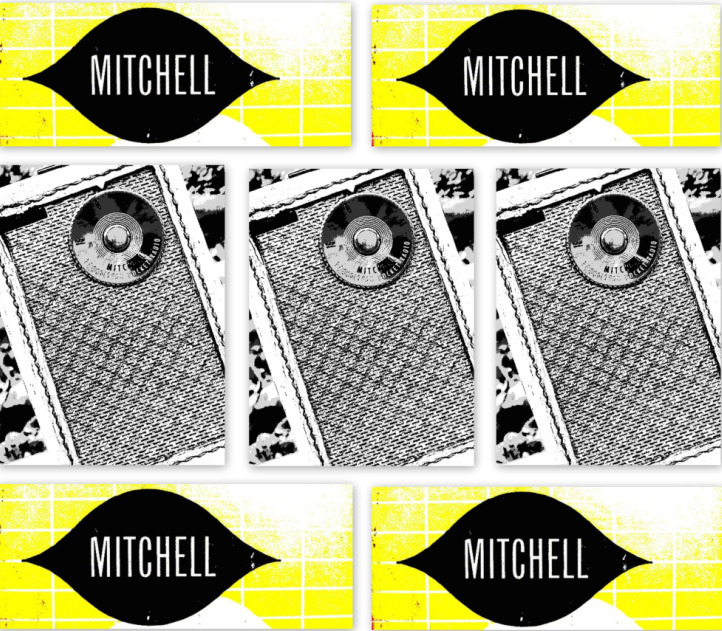 I know that Mitchell was making tube radios pre 1950 but I have no other knowledge of them. 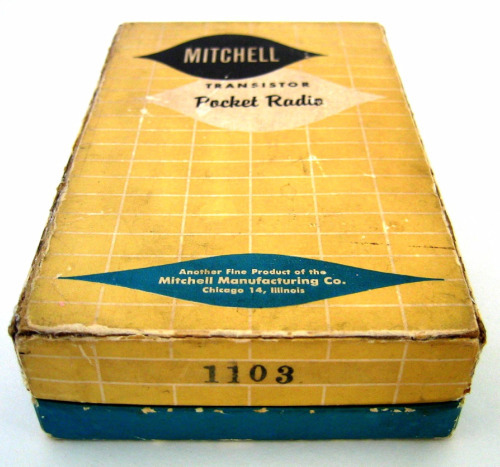 This Mitchell comes with its original box and considering how rare the radio is that makes this box ultra rare! The article below showing a picture of a Mitchell appeared in an October 1955 edition of Popular Science. Looking inside this Mitchell 1103 you will find a Regency TR-1 chassis. It has exactly the same layout as a Regency TR-1 with the Jensen brand speaker and the painted transistors manufactured by Texas Instruments. A map of Texas is visible on one of the transistors. 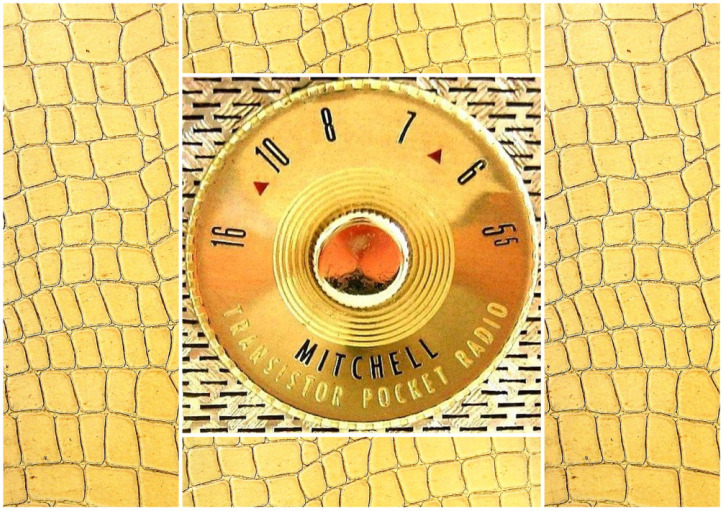 On the tuning capacitor is a date code of 541 indicating that this Mitchell was manufactured within two weeks of the 41st week of 1955. There are a couple of wires soldered to the battery clip, I’m unsure why… The battery used is a standard 22.5V as used with all Regency TR-1s. 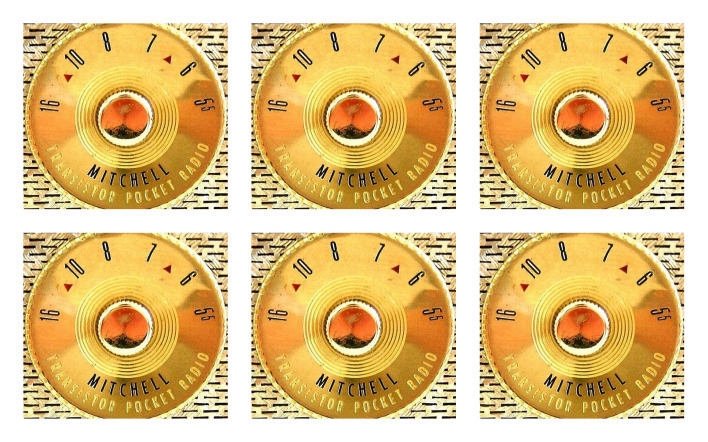 This Mitchell works at very low volume, it probably needs a recap. On Regency TR-1’s the serial number is located on a sticker between the battery clips but on this Mitchell there is a gold sticker with battery information but no serial number. As this is the only Mitchell that I own I cannot say if they were made without a serial number or not, perhaps someone more knowledgeable than me can verify this. There is a beautiful gold label attached inside the back cover. 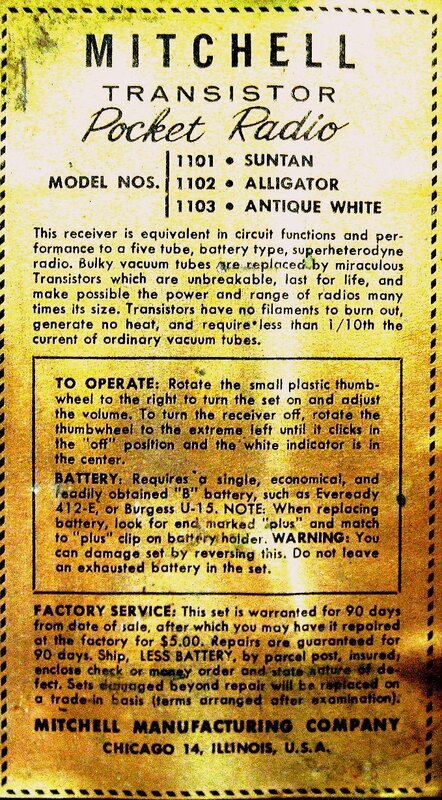 This label gives the user instructions for operating the radio, factory service and battery info.